I just hatched and Im hungry! 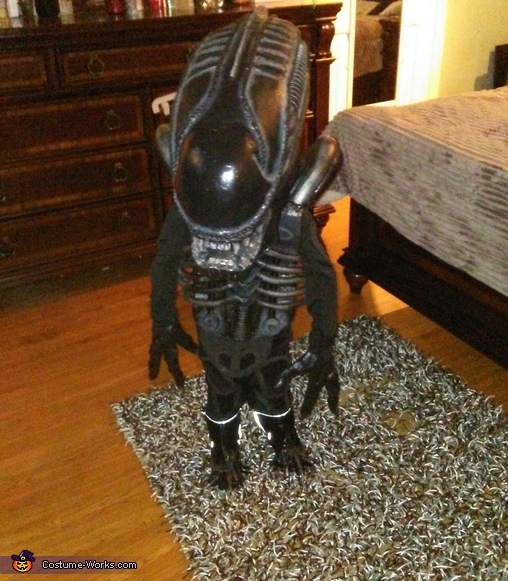 3 year old Bella loves Aliens even though she is creeped out seeing her own costume sometimes. Head is made out of insulation foam and body made from Dollar Store Foam Boogie Boards and Pool Noodles were used for the back pipes and tail. Gloves were made from chopped up monster hands and toes were made from the same. Detail parts were made from craft foam and cut up corduroy pants. This Alien Xenomorph just hatched! Hissssss! !